The more India delays the resumption of dialogue, the better it is for the Taliban and all those who want the peace process to fail. Fresh from his election victory, Prime Minister Manmohan Singh needs to move quickly and decisively to break the logjam in India’s relations with Pakistan. In the wake of last November’s terrorist attacks on Mumbai, the government suspended the composite dialogue process and placed its armed forces on high alert. The military establishment in Pakistan, which was perhaps never fully comfortable with the direction in which the peace process with India had gone over the past few years, took advantage of the situation to move its forces to the border and generate international concern about the danger of war. The crisis coincided with the transition to the Obama presidency and tension between the two neighbours fitted in nicely with the notion of an extended AfPakInd zone in need of stabilization. India fought off the idea of explicit linkage between Kashmir and Afghanistan but that does not free New Delhi from the responsibility of trying to shape the strategic choices Pakistan faces on both its western and Indian frontiers. 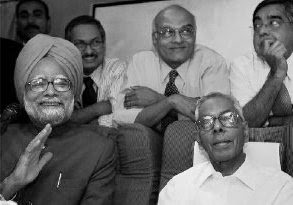 Dr. Singh and his foreign policy team – especially Foreign Secretary Shiv Shankar Menon and National Security Advisor M.K. Narayanan – did well in the days immediately after the Mumbai attack to temper India’s response. The Prime Minister correctly analysed the fractured and transitional nature of Pakistan’s polity and came up with the policy of ‘flexible containment’ in order to isolate those sections of the establishment across the border who were the most unremittingly hostile towards India. With others, the idea was to try and have business as usual. This policy was fine in theory except for the fact that the principal step India took in this direction –suspension of the composite dialogue – did little to “contain” the threat posed by jihadi terrorism and their backers in the Pakistani military establishment. There has been some progress on the Pakistani side on the two demands raised by India – arrest and prosecution of the Mumbai conspirators, and the dismantling of the infrastructure of terror – but mainly because of international and internal pressure on Islamabad and not out of a longing to go back to the dialogue with India. And today, in the face of this reality, Indian policy has begun to drift in the direction of containment of a more general kind. Pakistani journalists were not given visas to cover the Indian elections, an absurd decision by any yardstick. Trade across the Line of Control and Wagah is booming and officials on both sides need to discuss what can be done to facilitate and expand border commerce. But because the composite dialogue remains suspended, no forward movement is possible, not even on issues which are unambiguously in India’s interest. Nor is there clarity on how serious India is about its two immediate goals. How else can one explain the unconscionable delay in correcting the equally unconscionable mix-up in DNA samples that New Delhi handed over in March of the Mumbai attack terrorists? Or the fact that two weeks were wasted for no reason in handing Ajmal Kasab’s confessional statement to the Pakistani authorities despite the trial court granting permission for this on May 2? As for the demand for dismantling the infrastructure of terror, the Indian side has no clear metric on the basis of which such a demand can be deemed to have been fulfilled. “We will know when they have done it and they will know that we know” is what senior Indian officials say when pressed on this point. Let us be clear that India’s two demands are just and there can be no resiling from them. Its current approach, too, has much to commend it. But the Prime Minister needs to ask if flexible containment might soon start producing diminishing returns and if so, whether it is time to switch to a policy of flexible engagement. A policy of flexible engagement would involve four elements. First, resumption of dialogue on all non-Kashmir issues such as trade and Sir Creek coupled with reversion to the liberal visa regime for Pakistani opinionmakers, activists, businesspersons etc. Second, the Kashmir component of the dialogue too can be revived immediately provided the Government of Pakistan is in a position to tell India that all domestic stakeholders are willing to claim ownership over whatever has been achieved in the back-channel discussions between Dr. Singh and former President Pervez Musharraf. Third, India should express its willingness to add other subjects as standalone components of the dialogue such as integrated water management – an emerging concern in Pakistan – once the requisite bilateral confidence has been built up on the terrorism front. Fourth, a bilateral dialogue on Afghanistan could also be considered to allay concerns in Pakistan and India about each other’s intentions. Is the Zardari-Gilani set-up in Pakistan in a position to deliver positive outcomes to India on terrorism and other issues? There are reasons to believe it might be. For one, the fact that Islamabad never exploited the Indian delays in the handing over of evidence to justify derailing the Mumbai investigation surely counts for something, as do the arrests it made. Second, the military action against the Taliban in Buner and Swat appears finally to have turned into a genuine attack on the terrorists rather than the phony war it seemed all these weeks. Islamabad may still not fully change course on anti-India terrorism but Dr. Singh will lose nothing by trying a new approach. He will also take away from the Pakistani military the one argument they have used to resist fully committing themselves to the fight against the Taliban and al-Qaeda: that India remains hostile to the idea of peace. The key element in this entire scheme is speed. The longer Dr. Singh delays the switch from flexible containment to engagement, the harder it will be to get off the treadmill to nowhere we are currently on. The perpetrators of Mumbai, whoever they were, did not want Pakistan to be at peace with India. Let them not have their way. It would be too premature and cowardly to bring them back on them table until they fulfill the commitments they've been making over the years. Traditionally, the AfPak tribes were never hostile to India. We would worry only when Taliban takes over. But thats not going to happen, I am sure. When the idea of composite idea was first mentioned, I was extremely thrilled at the possibility of discussing various issues and not just Kashmir. However, over the years, we have seen continously that this dialogue was used more as a threatening tool in bad times ( cancelled each time there is a terror attack) and in good times, as an instrument to show case to the world that we are interested in dialogue. We always see a set pattern in our reaction. There is an attack; everybody condemns it; Pakistan is blamed; the dialogue is cut off; and then it is resumed. I think cancelling it and reviving it on a regular basis has only dented our image rather than Pakistan's. The PM himself has said there is a foriegn hand involved in Mumbai Train blasts, and after that we haven't heard anything. Even after the spate of terrorist attacks, and the recent Mumbai attacks, it is taking an unusually long time for the diplomacy to react. Part of the reason I think is that we lack a clear political direction in the External Affairs Ministry. The picture in your article sums it up :-) The show has been primarily run by S.S.Menon and the NSA. Pranab Mukherjee did lead the ministry well, but he didn't bring in anything new to the ministry. The diplomatic initiatives tend to maintain status quo rather than achieve tangible results. Even your article tends to suggest that we need to speed up existing procedures. Unfortunately, with the kind of political unstability prevailing in Pakistan, I don't see if we can any substantial progress in our deliberations. I strongly feel it will be status quo even after an year from now. The challenge in Indo-Pak talks is mutual distrust. On top of it, the Pakistani establishment is either unable or unwilling to honor commitments made during peace talks. This results in the start-stop cycle of Indo-Pak peace process. There is news that India and Pakistan are sharing selective intelligence in tracking terrorist groups. The US is the interlocutor. May be this the way to go for resolving the border disputes between India and Pakistan? Very interesting analysis on the need to strengthen the Indo-Pak peace process to dilute the role of militants and undermining the anti-India lobby in Pakistan. After reading the article, I feel very energised to run to MEA to shout at them for wasting the time. I hope some one reads it in MEA and understand the importance fo it. By the way, your new photo, taken in Germany, is good. As far as Kashmir is concerned, India may agree to converting the current Line of Control as the International border. That is the only pragmatic solution. There are several precedents to this. Bengal was divided between India and East Pakistan. Punjab was divided between India and West Pakistan and Pashtunistan was divided by the Durand line. Pakistan is welcome to accept the line of control as the international boundary anytime it chooses to do so. The reason that there is a strong presence of the Indian army near the Pakistani border is to prevent infiltration by terrorists from Pakistan. Often under cover fire from the Pakistani army. Every week there are reports in the Indian press of pitched battles as the Indian forces try and stop the terrorists from entering India. No Indian government can order its military to withdraw from the border while terrorists are entering on a regular basis. The only way the US Af-Pak strategy will work is if the ruling elite in Pakistan (i.e. the Army ) finally realize that it is not in their best interests to keep India as the bogeyman. Until now, the demonizing of India has allowed the Pakistani army to control Pakistan. Like some one correctly said, Most countries have an army while in Pakistan the army has a country. That calculus will have to change for the Pakistani elite. It seems Siddharth is avoiding the whole question of justice. Can one really equate putting the "peace process" back on track with giving justice to the victims of Mumbai, just because it is alleged that the perpetrators of Mumbai do not want Pakistan to be at peace with India. Justice first. By this metric, the resounding victory of the secular Congress negates any need to investigate the Gujarat killings, since the perpetrators of that crime wanted to undermine the secular state. Why should the interests of the foreign policy elite trump the right of ordinary citizens to justice? As for metrics for dismantling the terrorist infrastructure (which probably means the Pakistani state), Advani mentioned metrics years ago - handover the list. Any action has to indicate a break with the past on the part of Pakistan. Anything else is just tactical manouvering to please the Americans. More like forced policy of foreign elite trump the right of ordinary citizens to justice!